The 2012 Move an Asteroid Technical Paper Competition winner, Sung Wook Paek, a graduate student in MIT’s Department of Aeronautics and Astronautics, proposed using a paintball strategy that builds on last year’s competition winner’s idea of deflecting an asteroid with a cloud of solid pellets. How might one encourage such a deflection? The answer, according to an MIT graduate student: with a volley or two of space-launched paintballs. Sung Wook Paek, a graduate student in MIT’s Department of Aeronautics and Astronautics, says if timed just right, pellets full of paint powder, launched in two rounds from a spacecraft at relatively close distance, would cover the front and back of an asteroid, more than doubling its reflectivity, or albedo. The initial force from the pellets would bump an asteroid off course; over time, the sun’s photons would deflect the asteroid even more. Paek’s paper detailing this unconventional strategy won the 2012 Move an Asteroid Technical Paper Competition, sponsored by the United Nations’ Space Generation Advisory Council, which solicits creative solutions to space-related problems from students and young professionals. Paek presented his paper this month at the International Astronautical Congress in Naples, Italy. The challenge put forth by this year’s U.N. competition was to identify novel solutions for safely deflecting a near-Earth object, such as an asteroid. Scientists have proposed a wide variety of methods to avoid an asteroid collision. 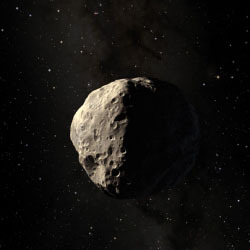 Some proposals launch a projectile or spacecraft to collide with an incoming asteroid; the European Space Agency is currently investigating such a mission. Other methods have included detonating a nuclear bomb near an asteroid or equipping spacecraft as “gravity tractors,” using a craft’s gravitational field to pull an asteroid off its path. Paek’s paintball strategy builds on a solution submitted by last year’s competition winner, who proposed deflecting an asteroid with a cloud of solid pellets. Paek came up with a similar proposal, adding paint to the pellets to take advantage of solar radiation pressure — the force exerted on objects by the sun’s photons. Researchers have observed that pressure from sunlight can alter the orbits of geosynchronous satellites, while others have proposed equipping spacecraft with sails to catch solar radiation, much like a sailboat catches wind. In the event that a giant asteroid is headed toward Earth, you’d better hope that it’s blindingly white. A brightly colored asteroid would reflect sunlight — and over time, this bouncing of photons off its surface could create enough of a force to push the asteroid off its course. How might one encourage such a deflection? The answer, according to an MIT graduate student: with a volley or two of space-launched paintballs. In his proposal, Paek used the asteroid Apophis as a theoretical test case. According to astronomical observations, this 27-gigaton rock may come close to Earth in 2029, and then again in 2036. Paek determined that five tons of paint would be required to cover the massive asteroid, which has a diameter of 1,480 feet. He used the asteroid’s period of rotation to determine the timing of pellets, launching a first round to cover the front of the asteroid, and firing a second round once the asteroid’s backside is exposed. As the pellets hit the asteroid’s surface, they would burst apart, splattering the space rock with a fine, five-micrometer-layer of paint. From his calculations, Paek estimates that it would take up to 20 years for the cumulative effect of solar radiation pressure to successfully pull the asteroid off its Earthbound trajectory. He says launching pellets with traditional rockets may not be an ideal option, as the violent takeoff may rupture the payload. Instead, he envisions paintballs may be made in space, in ports such as the International Space Station, where a spacecraft could then pick up a couple of rounds of pellets to deliver to the asteroid. Lindley Johnson, program manager for NASA’s Near Earth Objects Observation Program, says Paek’s proposal is “an innovative variation” on a method used by others to capitalize on solar radiation pressure. For example, MESSENGER, a spacecraft orbiting Mercury, is equipped with solar sails that propel the craft with solar radiation pressure, reducing the fuel needed to power it. “It is very important that we develop and test a few deflection techniques sufficiently so that we know we have a viable ‘toolbox’ of deflection capabilities to implement when we inevitably discover an asteroid on an impact trajectory,” Johnson says. William Ailor, principal engineer for Aerospace Corp. in El Segundo, Calif., adds that the potential for an asteroid collision is a long-term challenge for scientists and engineers. Be the first to comment on "Space-Launched Paintballs Could Possibly Deflect an Incoming Asteroid"